Sweet Wall took place in 1970 in Berlin, on wasteland close to the Berlin Wall among the skeletons and wreckage of buildings bombed during the Second World War. The intervention consisted of the construction of a concrete wall about thirty meters long and half a metre tall. The mortar used to join the blocks consisted of strawberry jam spread onto slices of bread. 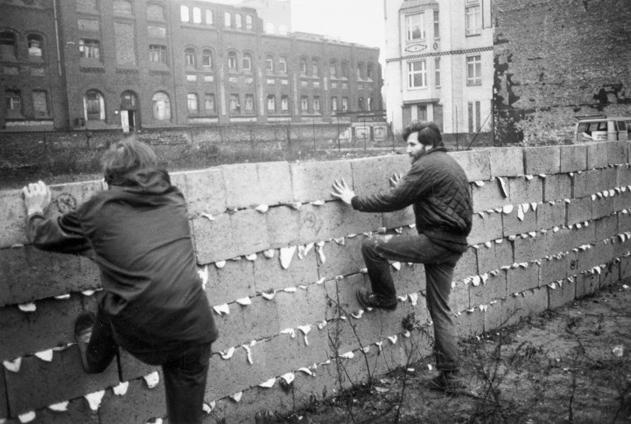 Allan Kaprow constructed the wall with the cooperation of a dozen people and it took a whole afternoon to build. Once finished, they knocked it down. Several years later, Kaprow described this intervention as a “political parody”. The design for a reinvention of this action is placed in the context of the cooperation that has been established between Fundació Antoni Tàpies –where the exhibition Allan Kaprow. Other Ways takes place– and the cycle of exhibitions Preventive Archeology being staged in Espai 13 of the Fundació Joan Miró, and is an attempt to reflect onf the condutions of production of historical memory. Thus, they are carried through, three updates of the action performed by different groups and organisations connected to historical work, which are related educational centres, universities, spaces for commemoration and historical memory. Through the concept of reinvention, Allan Kaprow highlighted the impossibility of repeating a same action, and the necessity to rethink the activation of his own artistic actions from present conditions. In accordance with this, the different participating groups are invited to take over Sweet Wall in order to link it to the present, transforming it into a useful artifact that necessarily comments upon current socio-political circumstances. At the same time, the possibility of taking over Sweet Wall aims to generate debate around the conditions in which we proceed on the recovery of memory, and hence, to analyse in each case the tension between the mere repetition of the action and its possibilities for new meaning and reformulation. Reinvention curated by Oriol Fontdevila. Organized by A*DESK Study Program 2013-201 in collaboration with the Antoni Tàpies Foundation and the Joan Miró Foundation. With the participation of Mónika Ardila, Rosario Ateaga, Irati Irulegi, Chiara De Marco, Jordi Maseras, Masha Perskaya, Sergi Velasco. The A*DESK Study Program 2013-2014 participants reinvented Sweet Wall by reinterpreting the piece for the purpose of reflecting upon and denouncing the numerous outrages and abuses of power committed during the last few years by the so called Mossos de Esquadra, the police corps of the Catalan government itself. The police force recently incorporated the use of a deterrent tool–LRAD, Long Range Acoustic Device–as a way of discouraging public demonstrations. For these reinventions of Sweet Wall the participants made use of a device that also acted as a sound barrel, which made sounds in very high frequency and which, together with the use of manipulation and distortion of Kaprow’s written instructions for the piece, emulated the sound of the LRAD device. During April 3rd the reinventions were repeated at 9 different locations in Barcelona, and they all took place at the exact hour that the original abuses had occurred and had been reported. The first was at 7 am at Catalunya Square, where on May 27th 2011, the Mossos de Esquadra’s police perpetrated a brutal attack while attempting to evict the camp of 15-M Movement, the anti-austerity movement in Spain. During the same day, the city could also hear the modified sound barrel with Kaprow’s instructions from other locations. 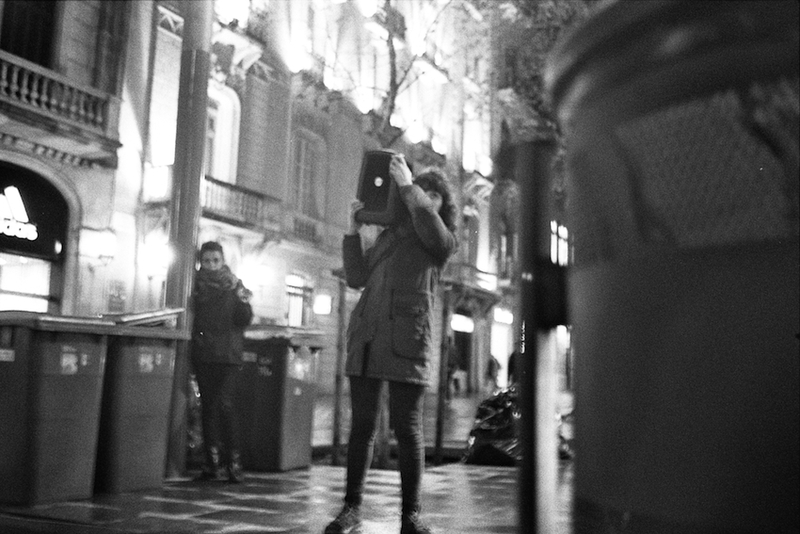 For example, around 6 pm another reinvention took place at the same corner (Passeig de Gràcia) and time at which the activist Ester Quintana lost one of her eyes due to a projectile shot fired by the police during the demonstration of November 14th, 2012. The last action was launched at 11 pm at Aurora Street where on October 5th, 2013, eight policemen detained Juan Andrés Benitez, who lost his life some hours after from the violent abuse he suffered. Sweet Wall. La Jonquera. April 4th, 2014. Reivention curated by Oriol Fontdevila. Organized by UDG, Girona University, and MUME (the Memorial Museum of Exile), in collaboration with the Antoni Tàpies Foundation, the Joan Miró Foundation, Conservas Vilamajor and IES La Jonquera. With the participation of Oriol Abulí?, Pepa Balsach, Mercè Casas?, Carles Chacón, Lluïsa Faxedas, Roger Ferrer, Jordi Font, Sara Forgas?, David González?, Irene Pujadas?, Miquel Serrano, Maria Soler?, Montse Visa. A team of volunteers consisting of students and teachers of the Chair of Contemporary Art and Culture and the Master in Cultural Tourism of the University of Gironda, along with the staff of the Memorial Museum of Exile, restaged Kaprow’s Sweet Wall for the purpose of drawing attention to one of the still controversial topics of contemporary Spanish culture–the conservation and commemoration of the heritage of the Franco dictatorship. This reinvention was staged at the Pyrenean border where a line of bunkers had been built during the first days of the dictatorship in order to prevent a possible attack from the Allied forces after the Second World War. The reinvention took place inside one of those bunkers, making use of the elements that had been employed by Kaprow himself for the original Sweet Wall: a line of about 50 inches long was made with expired jam on the bunker’s concrete floor. The line of jam extended from one end of the bunker to the other. Then, onto the jam pictures depicting the past and present history of the same Pyrenean borderline were glued. Finally, the participants removed the jam and the pictures. Sweet Wall. Bellvitge, L’Hospitalet. April 5th, 2014. Reinvention curated by Oriol Fontdevila. Organized by LaFundició and Necronomicon’s role-playing game club, with the collaboration of the Antoni Tàpies Foundation, the Joan Miró Foundation, the Bellgrup cultural association, La Tele Channel, Neucat Neumáticos, and SEAT 1430, 124 y 124 Sport’s National Club. With the participation of: Alberto Antolín, Álbaro Barril, Francisco José Basilio, Associació Cultural Bellgrup, Raquel Cañadas, Andrea Carballido, Manuel Domínguez, María Jesús González, Carme Hernández, José Márquez, Ana Martínez, María Ángeles Mesa, Raquel Ruiz, Rosa Sanjoaquin, Emiliano Vázquez. This reinvention of Sweet Wall was set during the second stage of a role-playing game, about the 1976 boycotts in Bellvitge, L’Hospitalet. The collective, LaFundició, and the Necronomicon association invited the members of community in that area to re-enact certain incidents from the neighbourhood’s fifty years of history. 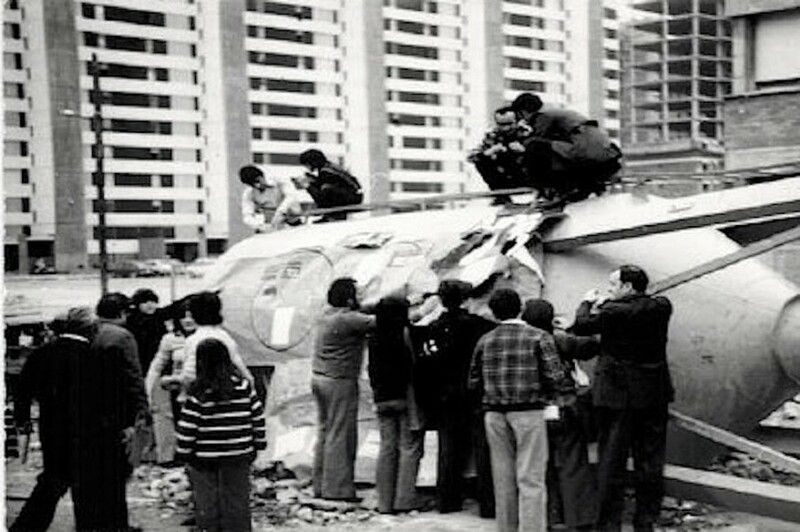 The play-acting during this reinvention of Sweet Wall was focused upon the recreation of the 1976 boycott that the residents of Bellvitge, who lived in one of the most damned ghettos in Barcleona, led against the construction of new but very poorly built residential blocks and their few surrounding amenities. In this context, Kaprow’s seminal wall was represented by a row of cardboard boxes filled with bread and jam gathered from local merchants, which referred to the shabbily built new blocks of flats then under construction. The demolition of the cardboard boxes reflected the combative spirit of the boycotters, their strong network of social organizations, and their successful termination of all the poor construction. LaFundició: Boicot a las obras ¡la película!